Miss Matched and Marvelous: I have a new crush! Cupcakes! I've found and fell in love with a new blog. Kimberly at Attempting Creative is a genius in everything she does. Cooking, crafting, sewing...heck even at being just plain adorable! She may not know me from the other 100+ followers she has, but I am now consider myself loyal. Kinda like a kid asking over and over "are we there yet?" I find myself checking her blog throughout the week wondering when the next post will come! Maybe i'm a bit of a blog stalker? First step is admitting it...right? So go check her out. 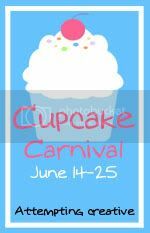 She's got a Cupcake Carnival with oodles and gobs of good receipes and amzing photos to get your mouth watering and sweet tooth begging for mercy! Click on the button below!